The boom in eBooks and eReading has presented unprecedented challenges for Auckland Libraries. How do you read? In the bath or on the bus? Fiction or non-fiction? For work or for leisure? In recent years, these traditional choices have been joined by those of a more technological nature such as: traditional book or eReader? Kindle or Kobo? Many readers have been converted to eReading by the cost and convenience of eBooks, even as they mourn the tangible qualities of a physical book. 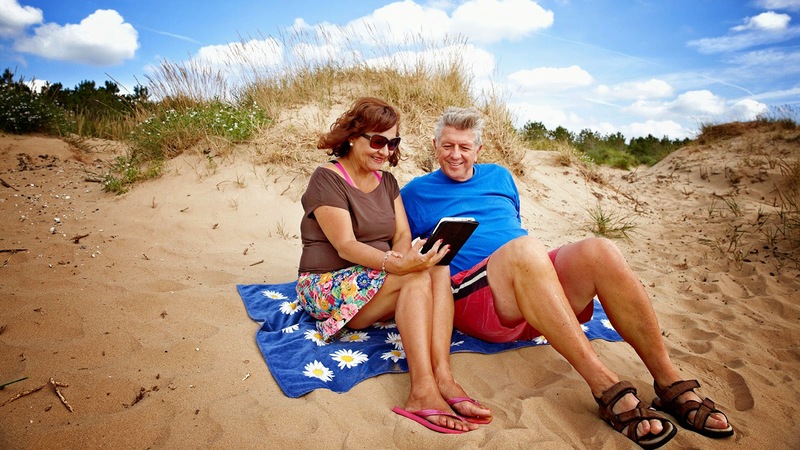 Readers all over the world are embracing eReading technology as part of their everyday lives. The growth in eBooks and eReading of all types is one of the biggest technological step-changes of the last ten years. With the development of eReader technology, most famously the Amazon Kindle in 2007, eBooks have rapidly become easier to find, borrow and read. This technological and cultural shift has had implications for public library systems all over the world, with many rushing to provide equitable access to digital versions of popular books. In 2007, Auckland City Libraries offered a new eBook lending service to customers via a platform called OverDrive, and free eBorrowing was made available to Aucklanders for the first time. However, providing free eBook and eAudiobook lending services under the strictures of a public library system has proved an unprecedented challenge. Copyright issues, technological limitations, constantly evolving eReading technology and a rapid growth in demand have caused many a headache for those at Auckland Libraries for whom eReading is a key priority. “When we started offering eBooks to customers, we had only one platform and the types of devices available were in their infancy," says Manager of Regional Collections at Auckland Libraries, Louise LaHatte. In 2014, Auckland Libraries introduced three new eBook platforms and eMagazine platform Zinio. 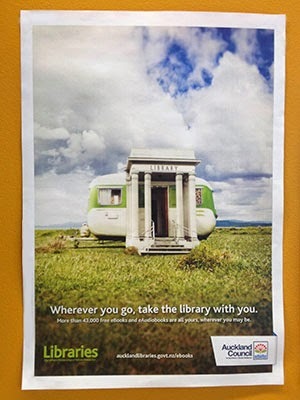 Over summer 2014-15, a major promotional campaign was run with the tagline ‘Wherever you go, take the library with you’. The goal of the campaign was to get the word out that Aucklanders can access a vast collection of eBooks, eAudiobooks and eMagazines from their library at no cost. The campaign pointed to a longer-term objective: 1 million eIssues by the end of 2015. This goal has been identified as a key milestone in the fulfilment of Te Kauroa, Auckland Libraries’ 10-year vision document, which aims for increased levels of customer satisfaction, increased use of collections, and more value for ratepayers. Offering eBooks to customers does come with challenges. Users of Auckland Libraries’ eBook services have found that browsing can be cumbersome, given that there is no way to simultaneously browse the seven platforms, and separate logins for each can lead to frustration for many. These difficulties are the result of technological constraints, and staff certainly join with customers in wanting browsing to be easier. Louise says some big changes are in the pipeline that will soon make borrowing eBooks a more enjoyable experience. “The challenge to public libraries is to offer readers easy-to-browse content that fits their reading habits across the multitude of devices they own,” she says. “We’re already working on some new developments that will make it easier for Aucklanders. A big project is underway to offer a single search across all our books, articles, eBooks and digital collections. We expect to have this completed by the end of the year – so watch this space. Despite the importance of eReading and digital literacy at Auckland Libraries, for most customers the traditional book is still king. In the latest customer survey, 74% of customers said they use their library to borrow printed books, while 32% reported having used eBooks. But the survey also shows that 17% of current non-users of eBooks anticipated they would start using eBooks in the next 12 months. Louise acknowledges that keeping up with our customers’ demand for eReading material is one of the most important challenges facing Auckland Libraries today. “Yes, we are purchasing more material than we are currently issuing, but numbers are not the only consideration," she says. "We need to be able to supply the range of content customers want, which is not as easy as it might seem due to restrictions on what can be purchased for New Zealand, the availability of content in other languages, and what we can get from our suppliers. It’s clear that rather than displacing traditional reading formats, eBooks may simply offer a complementary alternative to them. Indeed, the majority of customers who read eBooks read them in addition to traditional books. What’s certain is that Auckland Libraries is doing its utmost to ensure customers are able to read whatever and however they choose – whether it’s the latest Lee Child novel in paperback, last night’s New York Times on a tablet, or a digital download of the latest racy romance to Kobo. How do you read? Tell us in the comments below.